Interview by Kevin Morton | See more interviews with sleep specialists. In 1993 a landmark study in the world of sleep medicine estimated that around 30 million Americans (24% of all men and 9% of all women) suffer from obstructive sleep apnea, or disordered breating every night while they sleep. (You can learn more about what sleep apnea is here.) Today, 17 years later, still only a very small fraction of those 30 million with sleep apnea have been diagnosed and treated. Why is this? It may be partially due to the fact that many who have sleep apnea have no idea they have disordered breathing. They're asleep while it's happening, don't remember the short awakenings their body experiences in order to breathe, and possibly haven't been told that their snoring could be a sign of a serious problem. Raising awareness will help with this. SleepQuest founder and CEO Robert Koenigsberg with Sleep and Dreams professor and father of sleep medicine William Dement. The two have worked extensively together to increase the ease and accessibility of getting diagnosed and treated for sleep apnea. But low diagnosis rates are probably also due in part to accessiblily reasons. It takes a decently large effort, with regards to both time and cost, to recognize your health is at risk, seek out a sleep physician, follow through with a diagnosis test (often an all-night polysomnography affair), and if the test is positive then get the equipment you need to treat it. 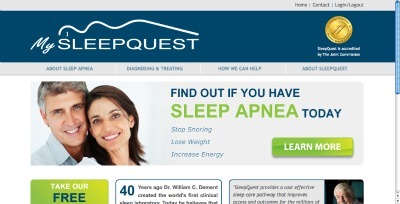 A company called SleepQuest (websites: SleepQuest.com for company info, MySleepQuest.com for patient resources) has recognized the scale of this effort though and made it their mission to make it easier for someone wanting to find out if they have sleep apnea to do so. And if they do have it, to then treat it effectively. They offer an expert-run sleep apnea home test that offers an extraordinarily easy diagnosis alternative to having a clinical test at a sleep center. Kevin: SleepQuest offers in-home testing and treatment for sleep apnea. How exactly does this work from the patient's end? Can you walk us through the process? Robert: The patient starts by filling out the screening questionnaire on www.mysleepquest.com and if the results indicate that the patient may have sleep apnea then they would make an appointment to visit their Primary Care Physician (PCP). If the PCP determines that a sleep study is warranted then he/she would write a prescription for an in-home diagnostic sleep study and this along with the patient's demographics, including front and back of their insurance card, would be faxed to our offices. We would then check Eligibility and Benefits with the patient's insurance company to determine if their insurance company will pay for the service and the amount of money they will be required to pay for their co-insurance. 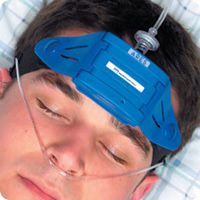 This is what the sleep apnea home testing device that is mailed to patients looks like. SleepQuest then calls the patient to let them know their findings and to schedule a convenient time to do the sleep study. The testing device is mailed directly to the patient's home along with video and written instructions. The device is usually worn for two nights and then returned to SleepQuest in the same box with a prepaid label placed on it. SleepQuest's Board Certified Sleep Physician then interprets the data and a written report is sent to the referring PCP. If the patient is positive for sleep apnea then he/she meets with his/her doctor and discusses treatment options. If the patient chooses continuous positive pressure (CPAP) then a prescription for a titration sleep study is faxed to SleepQuest and the same process takes place as described for the diagnostic study above. The titration test enables SleepQuest to determine the best pressure(s) to treat the patient's condition and the best type of long-term sleep treatment device. The PCP writes another prescription for the type of treatment device and pressure(s) written on the titration report. SleepQuest then goes through the same process with the patient's insurance company, contacts the patient for a convenient time to be set up with the treatment device before spending 45 minutes with the patient coaching them on sleep therapy and how best to be compliant with it. SleepQuest works closely with the patient during the first 48 hours and beyond to make sure that they continue to benefit from the therapy. If the patient has a milder form of sleep apnea or refuses to use a device as described above then a referral to a dentist for an oral appliance is an option. Kevin: In your mission statement and throughout your websites you talk a lot about a "continuum of care." Can you elaborate on that and what it means for individuals wondering what the best way for them to seek treatment is? Robert: A continuum of care as it applies to sleep medicine means that a patient has a single point of contact throughout the diagnostic and treatment process. What has occurred over the years is that the current sleep providers (i.e. sleep labs and home care companies) have been terribly fragmented for the patient causing a tremendous amount of confusion and frustration, resulting in patients giving up on their treatment and suffering from the deleterious medical consequences of untreated sleep apnea. At SleepQuest the patient is at the center of the care pathway and therefore receives individual care from a well trained Sleep Care Specialist who is accountable for the success of the patient throughout the diagnostic and treatment process. Kevin: For anyone with a busy schedule or apprehension of setting themselves up for multiple doctor appointments, the convenience benefits of an in-home test are obviously enormous. Are there other benefits, and conversely, are there any drawbacks to getting tested at home versus in a sleep center? Robert: Other benefits of our program include a much lower amount of out of pocket expenses for the patient and the convenience of having the test conducted in their own home while sleeping in their own bed. Home sleep testing is not the correct testing method for all sleep disorders. If a PCP determines that a patient may be suffering from a neurological sleep disorder then an in-lab sleep study would be the best location for the patient to be tested. These neurological sleep disorders are much rarer and therefore a referral from a PCP to these centers is often not necessary. SleepQuest works with the PCP to assist them in identifying which patients via questionnaire present symptoms that would necessitate an in-lab sleep study. Generally, sleep apnea can be likened to a plumbing problem whereby a reduction in airflow results from anatomical deficiencies in the upper airway. This can correctly be assessed with an in-home testing device. An in-lab study is necessary when the sleep disorder is caused by non-anatomical abnormalities that result in a sleep disturbance whose origin is neurologic. Kevin: SleepQuest was one of the first sleep apnea home testing solutions--you guys have been around for over 10 years now and treated thousands of patients. What have the results and patient responses been like? What are people saying about in-home sleep apnea tests? Robert: Many of our patients are very satisfied with receiving the testing in the comfort of their own home and express that the testing devices that we provide make the testing process a lot easier than they thought it would be. Patients are initially surprised that we can provide testing to any patient no matter where they live in the United States. We are finding from both our existing patients as well as our new patients that our newest initiative, the interactive educational resource site www.mysleepquest.com, is a welcome addition. MySleepQuest.com is Sleep Quest's latest addition. 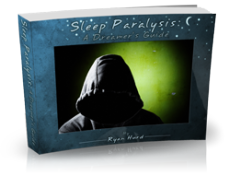 It offers a portal for indivuals with sleep apnea (or those who think they might have it) to learn about the condition and embark on treating it so they can live healthily once again. 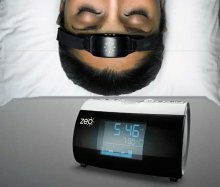 All of the devices we use for in-home sleep testing are well validated compared to in-laboratory sleep studies. This is interesting because in-lab sleep studies have never been validated in and of themselves; therefore comparing against them may not be as useful as one would hope. Also, since patients sleep so much better in their own bed with a portable device that actually allows for movement, for OSA the home seems to be the best place to accurately measure a patient's sleep. This is not to say that in-lab sleep studies are not needed. The big difference is that for patients requiring EEG monitoring because of neurological abnormalities, the sleep lab is the best place to have these studies done. Kevin: If I would like to get tested through SleepQuest what kind of cost am I looking at and can my health insurance help offset it at all? Robert: A majority of insurance companies reimburse SleepQuest for both our testing and treatment services. SleepQuest has over 200 million lives under contract. Most insurance companies approve between $250 and $500 for an in-home sleep study. If a patient has an 80%/20% health plan than their out of pocket would be $50 to $100. 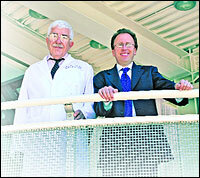 In addition the titration test and the treatment device are also covered by a majority of insurance companies. Kevin: If I am someone who thinks I may have sleep apnea, or if I know someone who I think may have it, what should my first course of action be? Robert: The first thing to do is to have yourself or someone you're concerned about fill out the screening questionnaire on www.mysleepquest.com. We'll get back to you with the results, and if they indicate that you may have sleep apnea then you would next want to make an appointment to visit your Primary Care Physician (PCP). If they deem a sleep study a good idea they'll write you a prescription for our sleep apnea home test and then we'll take care of the rest. If you have any more comments or questions for Robert--i.e. if you'd like to tell him what you think about SleepQuest, how ready you are to get diagnosed and treated from the comfort of your own home, etc.--feel free to contact him using the form below. Read more Interviews With Sleep Specialists. Go from Interview With Sleep Apnea Home Test Expert to What Is Sleep Apnea?